There are so many ways to show off your creativity and decorate your space, whether it is a door, apartment home or desk. Check out these unique Christmas crafts in this FREE eBook! Glitter always adds a special touch to the Christmas holiday, and candles also contribute to that festive atmosphere. 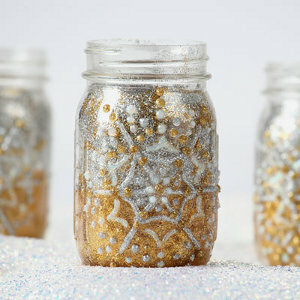 Create a little wintry cheer with these Light Up The Night Glitter Mason Jars by Pattie Wilkinson for I Love to Create. This mason jar craft is a fantastic way to decorate your home for the holiday season. Follow a few basic steps to create a new luminary for your home. It's amazing how glitter and candles go hand in hand, and this craft is perfect to create that gorgeous winter glow. Print out pattern, trim around pattern and tape to inside of jar to use as a guide. Paint dots of dimensional paint, following pattern to create a snowflake design. Keep jar lying down with painted side facing up until paint is dry. Brush Collage Pauge on the inside of jar. Pour in glitter while inside of jar is still wet. Let dry. Pour out excess glitter. Place glass votive inside jar. Add tea light to complete. Do you ever add colored lights, or do you just use the tea lights and a different color glitter? I bet it would look beautiful either way. I love that you can use these to light up a room by making as few or as many as you want depending on the space. What an intricate patterned snowflake! You know they say there are no two alike. I am very thankful for a guide these days. My hands are not quite as steady as they used to be. When I looked at the picture I thought all the painting and glitter was on the outside and I was trying to figure out how we'd be told to do it. Using both the inside and outside makes a whole lot more sense and it is beautiful!